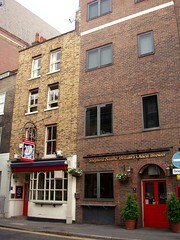 Shepherd Neame pub in Aldgate. The interior is quite traditional, with burgundy banquettes around the walls and a wooden floor, though there's at least one large flatscreen perched up in a corner near the ceiling. Kake visited on a Tuesday lunchtime in September 2009. There were only a couple of other customers in when I arrived a little after noon, but by the time I left an hour later there were about a dozen people in, and plenty of lively conversations going on. The flatscreen was showing a news programme with the sound off but subtitles on, which I thought was a nice compromise. Music was playing, but fairly quietly. Real ales available on handpump were all from Shepherd Neame, unsurprisingly; Whitstable Bay (£1.65/half), Spitfire, and Masterbrew (though there may have been a few others — I only noticed as I was leaving that they had another bank of five handpumps on the side of the bar). Lime and soda was 40p/pint. As of September 2009, food is served lunchtimes only, noon-3pm Mon-Fri (the pub's closed on weekends). The menu is reassuringly short, with just a soup, four or five cod-and-chips type mains (including a couple of specials), sandwiches, nachos, and potato wedges. Kake tried the "rare roast beef sandwich with beetroot horseradish" (£3.80) photo. Pleasingly, the beef really was rare, and the horseradish was evident, though I wasn't sure where the beetroot was supposed to come in. The salad on the side was fairly token, and not dressed, but it wasn't advertised in the first place so I didn't feel cheated. Accessibility: Level entrance, step-free access to bar and ladies'. Opening times taken from the Shepherd Neame website, March 2014. Last edited 2014-03-10 16:05:36 (version 10; diff). List all versions. Page last edited 2014-03-10 16:05:36 (version 10).